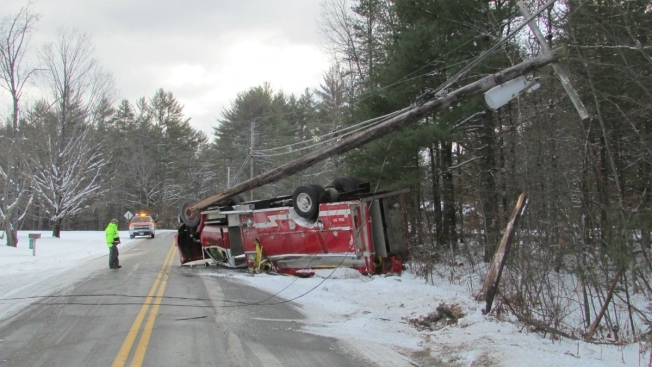 An Effingham, New Hampshire, fire engine rolled over and took out a utility pole on Wednesday morning. A fire engine in Effingham, New Hampshire, rolled over on Wednesday morning, knocking down a utility pole. Mellisa Seamans, an Effingham resident who lives nearby and photographed the scene, said the accident occurred around 10:15 a.m. on Province Lake Road, just a short distance from the fire station. The engine was returning to the station at the time of the accident. The Caroll County Sheriff's Department confirmed that the accident took place, and said they have officers on scene. New Hampshire State Police and Effingham Police also responded to the scene. There is no official word yet on injuries, but Seamans said the driver of the fire engine was out of the vehicle and walking around. Effingham is located just northeast of New Hampshire's Lakes Region, right along the Maine border. The road conditions in that area of the state were quite slick on Wednesday morning after Tuesday night's snowfall. Ossipee, located just south of Effingham, received about 4 inches of snow. Winds were also gusting up to 40 mph.